Sometimes you see a film which leaves an impression which will be remembered for many years, perhaps even for a lifetime. In 1980 I saw the movie “Earthquake”, presented in something called Sensurround – a puzzling name combined of two words “Sense” and “Surround” – and that was indeed what it was. Sensurround was a low frequency noise generator that added simulated rumble and vibrations to the movie, so intense and powerful that not only could it be heard, but also felt during the film! It was a very convincing illusion when everything vibrated. SENSURROUND left a lasting impression on me, and, as the ads described it, it was AN EVENT which I have never forgotten. Short of a 35mm test film for “Midway”, “Earthquake” has remained the only film I ever saw in SENSUROUND. Here’s a summary of the system, films, technique and as a bonus, some funny “horror stories”, about SENSURROUND. I just finished reading your very informative and enjoyable Sensurround write-up in Cinema Retro. It’s a great contribution to the latest issue of the magazine. 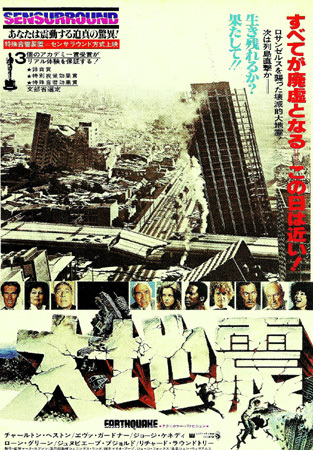 The original dramatic poster for "Earthquake". 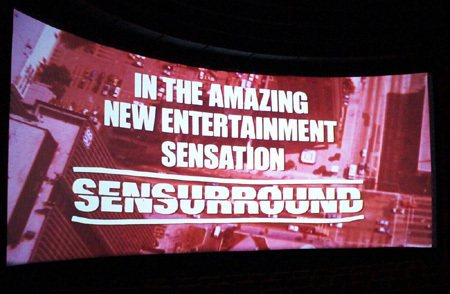 SENSURROUND, engineered & designed by Richard J. Stumpf, Robert J. Leonard and Waldon O. Watson at Universal Studios in the early 1970s, to enhance the audio experience of movies. The idea was very simple; get the audience away from their TV set and into the cinema by offering them something very special and completely unique to the cinema. 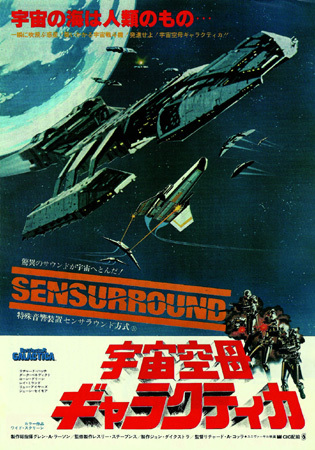 Only a handful of films were ever presented in Sensurround and although recognized with an Oscar by the Academy of Motion Pictures Arts and Sciences, in 1975, Sensurround was never widely accepted by the industry, and only a few years after it premiered, it joined CineMiracle, Smell-O-Vision and Fantasound, ending on the scrap yard of movie-formats, as yet another failed gimmick to get people back into the cinema. All innovative in their own way, but in the end, also too impractical, in one way or another. Sensurround was tailor-made for the first film to use it “Earthquake”, in which Los Angeles is destroyed by a large earthquake. The sensational system caused a lot of controversy because some cinemas experienced damage, and some people got sick from the vibrations. Was re-reading your articles about Sensurround. Earthquake at the Varsity theater here in Austin was very spectacular. Will never forget the vibrations in my chest. Almost disorientating. Later MIDWAY played at the Capitol Plaza Cinema. It was interesting how the sound played back with front to back movement. I used to have have a preview for MIDWAY that was encoded to play in sensurround. It was heavily compressed played normally but sounded great in sensurround. I need to see if I can find that. I suspect it's a rare thing. Anyway, Happy New Year to you and your family. Poster supplied by Cinema Retro. Maybe it ultimately failed, but Sensurround had a profound influence on how movies are presented today - both in cinemas, and in home-cinemas. 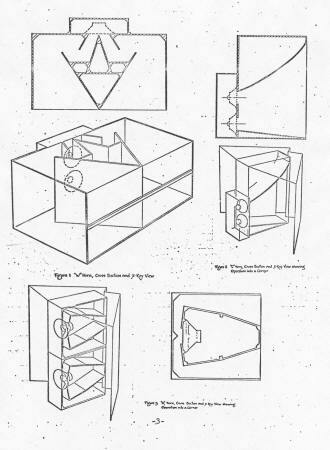 The “subwoofer” – a big speaker capable of reproducing deep powerful bass - was an unknown concept before Sensurround, at which time no speaker systems were capable of presenting anything under 40 Hz. Huge speakers with very large 18” drivers and powered by large amplifiers have since become standard in all cinemas. Around 1976/77 Dolby Laboratories began to add enhanced low-frequency channels to movie soundtracks. The audience flocked to see films “in 70mm Dolby Stereo”, because they knew it was a superior sound experience with Dolby’s “baby boom” bass soundtrack giving extra “punch” in the low end when needed. We can all thank the pioneering of Sensurround for that! 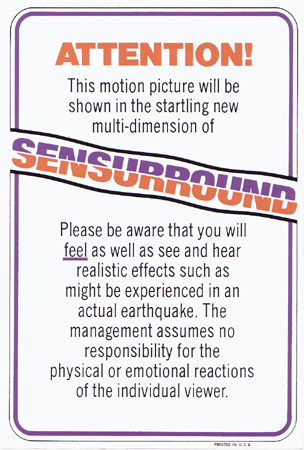 Sensurround sound was basically extremely loud noise, or rumble, played back during dramatic moments of the movie, to enhance the experience of an earthquake or effects such as gun fire from big cannons etc. The rumble frequencies were around 15 Hz and played back at a staggering sound level reaching 120 dB, which is below what the human ear can hear, but loud enough to be felt. Wikipedia explains it like this: (shortened) “The original Sensurround design used for "Earthquake" employed a noise generator, to create the low-frequency rumble, with the waveform matching that of the 1971 Sylmar earthquake”. The vibrations control box was turned on and off by two control tones - one of 25Hz and one of 35Hz, which were recorded on the print. 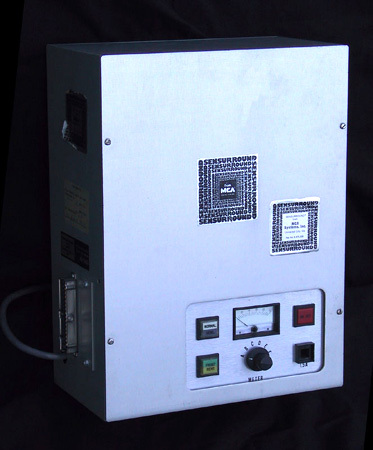 The process was developed almost from film to film, and by the time of “Midway”’s release the rumble was recorded on the film, not generated by the control box. Cervin Vega supplied all the 18” speakers for the system. They were built into very large horns designed and built on the Universal Studios lot specifically for Sensurround. Cervin Vega became very famous for that and used the Sensurround association in their marketing for many years. They even made a Sensurround home-theatre version. The speakers were installed under, or behind, the screens and in the rear of the cinemas. I remember seeing two gigantic speakers, almost at the size of a train, in the rear of the 3 Falke Bio in Copenhagen in 1980. The four front speakers must have been located behind the screen as I cannot remember seeing them. Amplifiers were BGW750s capable of delivering 1600 watts. That “peanuts” today, but was a big deal in 1974. Hey Thomas, I remember watching "Earthquake" in Sensurround when I was in high school back in the 70's. I remember the whole theater pratically shook, seats rattled, and the sound was so loud it was unbelievable. It was pretty cool as I remember it! Thomas - I saw all of the US-released Sensurround films during their initial release periods. They were all different in their use of the process. EARTHQUAKE was the best and most startling of the four films. MIDWAY was headache-inducing because the system was only used for explosions and plane engines. ROLLERCOASTER had the process on only when the rollercoasters happened to rush by, disappointing; and BATTLESTAR GALACTICA was also disappointing in that the system was used very sparsely. I saw EARTHQUAKE in 70mm and six-track stereo, and the Sensurround effect was really heightened by the expanded soundtrack. German poster supplied by Cinema Retro. Before installing Sensurround, all cinemas had to be checked to make sure the structure could withstand the rumble. Universal Studios sent their RCA [an engineering + tech service company, ed] field engineers to the cinema with a checklist covering every structural angle, but also making sure enough electricity was available to power the amplifiers. Each installation required three days of setting up Sensurround to make sure the system would work, but also making sure the cinema could actually handle the vibrations. In some cases, like the Chinese Theatre in Hollywood (where the film “World Premiered” 15. November 1974), it was discovered that the cinema suffered some minor damage from the vibrations, and a huge “fish net” was installed to protect the audience from fallen debris during Sensurround performances. Luckily, there were no reports about injured guests. It was a huge “road show” to distribute films in Sensurround, as all the BIG speakers had to follow the film prints around. 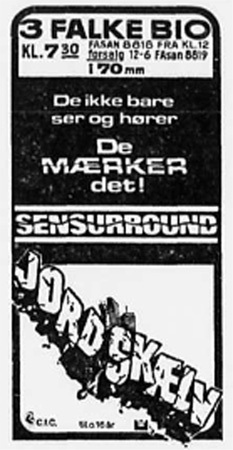 In Denmark, I have learned there were two sets of Sensurround equipment were available from distributor CIC (Cinema International Corporation). It was very expensive, and in the end, only practical in a few cinemas large enough to accommodate the equipment and earn enough at the boxoffice to make a profit. On top of that, the cinemas also had to pay a weekly fee to Universal Studios for having the speakers installed. Many systems were installed in older 1-screen cinemas, but at the same time, the multiplex cinema was starting to arrive on the scene, and that presented a lot of problems for Sensurround, because the noise from the rumble would disturb the cinema next door. A lot of people complained about this. Japanese poster supplied from the collection of Edward David and Cinema Retro. 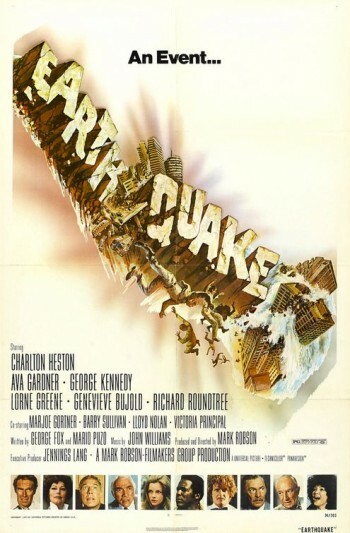 In the US, “Earthquake” opened in relatively few cinemas in Sensurround, but by the time most commercial screenings ended, some 300 cinemas were playing the film in Sensurround. 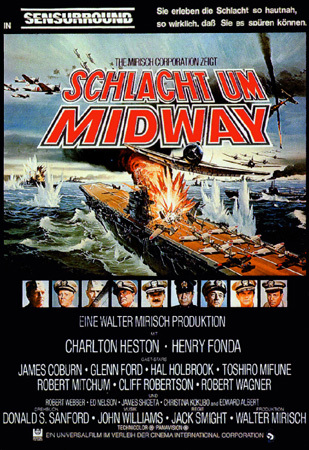 The following film, “Midway” premiered in nearly 300 Sensurround cinemas [18. June 1976]. By the time “Rollercoaster” premiered 10. June 1977, there were around 800 Sensurround equipped cinemas world wide, with 400 of them in the US. To the best of my knowledge, only two cinemas in Copenhagen showed films in Sensurround. I remember seeing all the 18” woofers piled up in storage in 1981. The cabinets had been scrapped long ago by then. 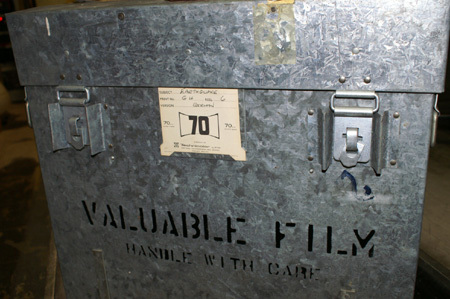 Similarly in the United States, Universal Studios had all their speakers and amplifier equipment stored across the nation after the last films had played. Everything was sold off at bargain prices in the early 1980s. Generator boxes, amplifiers and speakers occasionally appear for sale from private collectors. Recently a European collector offered a set of 18 subwoofers and amplifiers for sale for a very high price. 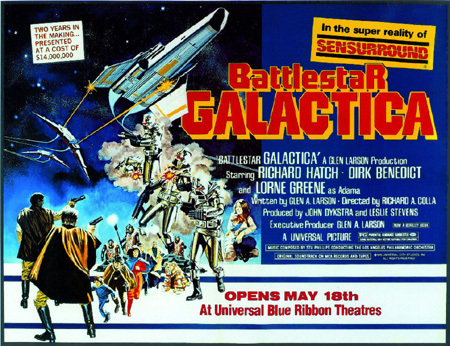 The pair of Galactica adventures actually came from a TV series, re-edited into two full length films with the added bonus of a Sensurround soundtrack. 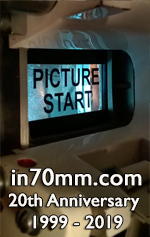 A sixth film “Zoot Suit” was premiered in 70mm “Sensurround Plus“ in the fall of 1981, however, this presentation did not use the horns and rumble. Instead, only DBX noise reduction was used. The film bombed, and that was the last anyone heard about Sensurround for many years. On an interesting note, a demonstration reel of footage from “Earthquake” was shown in Sensurround for thousands and thousands of people taking the Universal Studio Tour prior to the premiere in 1974. 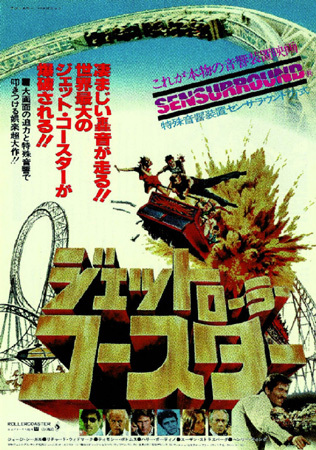 Sensurround was heard every time a rollercoaster drove by, and Sensurround was also used for music tracks (Which required Lalo Schifrin to score music for Sensurround). 6 reels with a total of 13 minutes of Sensurround. Every time the Galactica appeared on screen, the subwoofer began to rumble and make crashing sounds! “Earthquake” opened in 4 track magnetic sound and standard optical mono sound on 35mm film. In Europe and Japan, release was even done in 70mm with 6 track magnetic sound. Please be aware that you will feel as well as see and hear realistic effects such as might be experienced in an actual earthquake. The management assumes no responsibility for the physical or emotional reactions of the individual viewer. The Sensurround logo, with its broken letters, was stroke of genius. Easily recognizable on all Sensurround engagements of “Earthquake”, and of course for all subsequent films in the process. 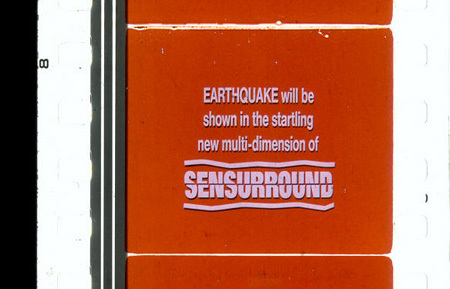 The word SENSURROUND in capital letters cracked horizontally to illustrate earthquake cracks. ..the projectionist consumed a lot more alcohol on the job than normal to try and numb his headaches from the constant rumble and vibration in the booth! I took my girlfriend to see „Earthquake“ and she complained about a sick stomach! We were in the balcony and it felt like it was a roller coaster at times. When The Branmar Theater in Wilmington, DE, which had shown all the Sensurround films closed in the late 80‘s, you could still see the cracks in the ceiling from the process! In Billings, Mont. they opened “Earthquake”. A knickknack/china shop occupied one of the storefronts. Needless to say, the morning after the opening all the wall-mounted breakables were in pieces on the floor. For the rest of the run, that store had to take down all of their wall displays every night and put‘em back up the next day! I received an e-mail last night from a gentleman in England who‘s wife got a nose bleed watching „Earthquake“ in Sensurround! Ceiling tiles would vibrate loose and fall on the audience, giving the true earthquake effect. On „Battle of Midway“, I walked inside on one of the rear beasts [speakers], and it was vicious. At the Fairlawn during the presentation of „Rollercoaster“, it was found that in either theatre, the Sensurround noise would intrude into the sound of the other theatre. The only option was to run the picture simultaneously in both houses. There were, of course, numerous tales associated with the running of this print (“Battlestar Galactica”), such as the elderly lady who lived behind the Fairlawn, complaining to the Toronto Transit Commission that they were running their subways especially loud at 8:00. UA Fox Theatre in Hackensack, NJ. The theatre was an old 1800 seat Egyption Art Deco with an awesome balcony. Sensurround presentations ended when part of the plaster ceiling came crashing down during a showing of “Rollercoaster”. Nobody was hurt, but the fact that 10 seats got crushed spooked the management. At the Elaine theatre the shockwaves killed all the goldfish in the pet shop at the other end of the mall. One of the most interesting aspects of the Sensurround „experience“ was watching the crowd reaction. I saw a couple people get up and run out of the theater in fear! Really! The down side was going to a movie in an auditorium next door. A renewed interest to show Sensurround came from England in 2003, when Darren Briggs and Bill Thomson from the City Screen in York re-created Sensurround for nearly a dozen screenings of “Earthquake” in 70mm across England. Starting from scratch, they found no surviving sets of original horns available and they even had to rebuild a new electronic rumble generator. To make „Earthquake“ presentations truly special, they even hired actors as “Surveyors” to warn and mix with the audience before the show, and they used smoke and lighting effects during the film. The illusion was complete. It was great showmanship and fun for the audience. People came from far away to see it. Some even from South Africa it was reported. The UK screenings were quite successful and this was followed by cinemas in the US and in Germany, where similar sold-out single screenings were also held. 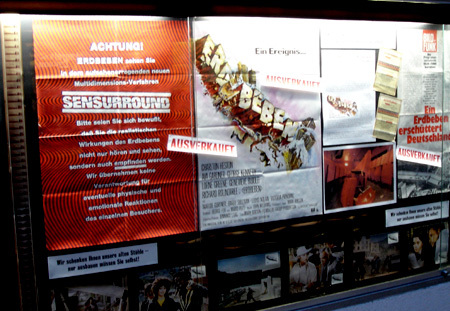 The most ambitious Sensurround revival so far took place during the first weekend of June 2010 at the Schauburg Cinerama cinema in Karlsruhe, Germany. The manager Herbert Born and his staff had spent almost 3 years planning and assembling film, speakers and techniques to present a complete collection of all 5 films in Sensurround. It was a weekend to be remember. Authentic 70mm film frame from "Earthquake"
The films are available for home viewing including the Sensurround tracks, so theoretically, with the right equipment; you should be able to play a home version of Sensurround. On the LP soundtrack of “Earthquake”, on side two, on the last track, you can hear a 2-minute sample of the Sensurround rumble.